AZURE KNITS BLOG: Blocking Tiramisu..
Yay! So out of that huge goal inventory list...I finished #5 out of 13+. 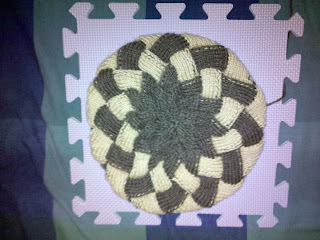 "Tiramisu" Entralac Hat is now done and is being blocked. "Giant Twist" Wrist Warmers are coming along, and I'm concentrating on "Berry Mix" Drawstring Lace Bag-Hat since yesterday and will be for few days. Multi-color Filmstrip scarf is almost at the crocheting stage. The KAMON series is going to be a one-hand work/drawing gauntlet. It is done prototyping, and I'm hoping the next one will be final.